You can then create a folder inside that folder for linked pictures, which keeps them handy for your project. You may also want to create a folder for files related to the project, such as the original word processing files given to you, notes about the project, and other files related to your project but that aren’t necessary for printing it. Click Project in the Create panel of the Welcome screen that appears when no projects are open, or choose File → New → Project. Either way, the dialog box shown appears. Enter a name for your layout in the Layout Name field. As explained previously, a project can have multiple layouts, and each layout can have a different name. At the moment, you’re entering a name for the first layout in your project. In the Layout Type drop-down menu, select the type of layout you want. Select the Single Layout Mode check box if you think you won’t be adding any further layouts to this project. Selecting this check box hides the layout’s name (Layout 1) from the project, which simplifies filenames if you export your layout as a PDF or other digital document. 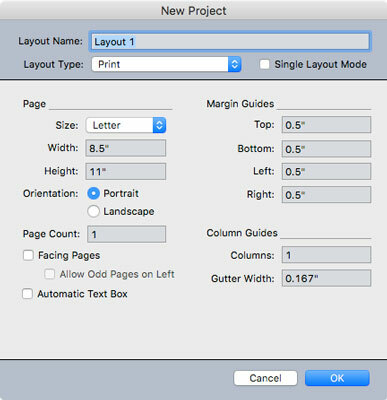 When you export your layout to PDF or other formats, the new file is named Project_Layout, using the project and layout names you assigned to them. (The project name is the same as the name of your file when you save it.) When in Single Layout Mode, the name of the exported file is simply the project name, which is the name of the QuarkXPress file on your computer. If you find yourself creating projects with just one layout most of the time, you can change QuarkXPress’s Preferences so that every new project has Single Layout Mode enabled by default. To do that, first close all QuarkXPress projects. Then, choose Preferences from either the QuarkXPress menu (Mac) or the Edit menu (Windows). In the Preferences dialog, scroll down to Project and click General. Select the Single Layout Mode check box. After that, every time you create a new project, the dialog box will already have the Single Layout Mode check box selected for you. To create a multi-layout project, just deselect that check box and a field will appear for you to name your first layout in the project. In the Page box, type a width and height for your layout or choose a preset size from the Size pop-up menu. You can save your own preset page sizes. To do that, choose New from the Size pop-up menu, and in the resulting dialog box, enter the dimensions of the page size that you want to save and give your preset page size a name, such as Postcard-6×4. For Orientation, select a button indicating whether you want your page to be Portrait (tall) or Landscape (wide). In the Page Count field, enter how many pages you think you’ll need. Don’t worry: You can add and remove pages later. If your layout will have left and right pages (as in a magazine), select the Facing Pages check box. This setting enables you to have different margins and Master Pages for the left- and right-facing pages. If you know that your layout will require having odd page numbers (1, 3, 5, and so on) on the left-facing pages, select the Allow Odd Pages on Left check box. Normally, you keep this unselected. If you want QuarkXPress to be able to add new pages automatically as your text grows (for example, in a long document), select the Automatic Text Box check box. This setting places a text box within the margins of the Master pages and applies that text box to every page based on that Master page. Set the Margin Guides as needed. These special guides indicate the “live” area of your layout, where your main content will be (text, pictures, and so forth). Items such as your page numbers, headers, and footers will normally be in the Margin area, so be sure to leave room for them if you plan to use them. If your layout will have several columns, enter the number of columns in the Columns field under Column Guides. The Gutter Width field determines the space between the columns. QuarkXPress then does the math for you and places guides within the Margins on each page, as necessary for the number of columns and gutter width you entered. If you enabled the Automatic Text Box check box (see Step 9), the text box will have these columns as well; otherwise you need to set the number of columns for each text box manually. Click OK to create your new layout with these specifications. Conveniently, QuarkXPress remembers these specifications and fills them in for you the next time you create a new layout or project. Of course, you can also choose all new specifications when you create a new layout or project.